My favourite part of my trip to Cuba were the days spent in the Cuban town of Trinidad. The pictures may not convey this but ‘what a dramatic place’ frozen in time and bursting with life, colour and charisma. The atmosphere is just fantastic, live music and vibrancy everywhere you look. 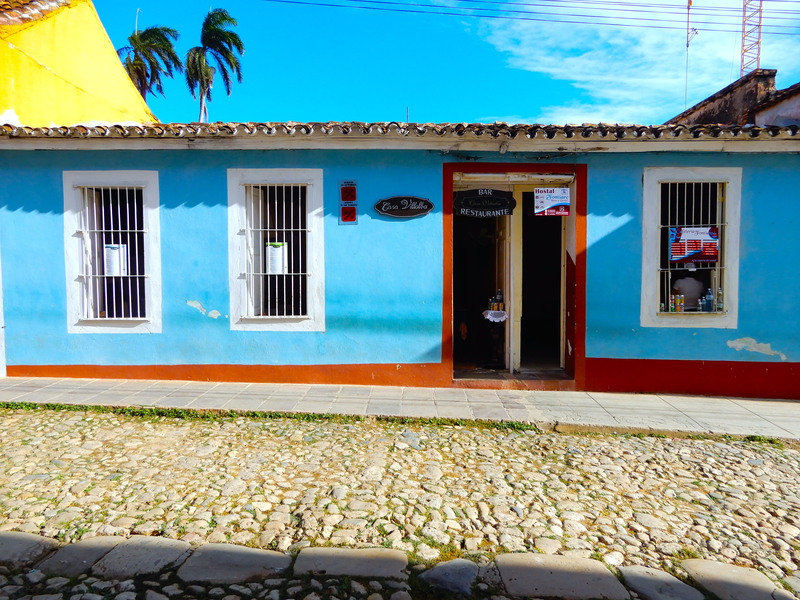 I loved Trinidad instantly, more than Havana or anywhere else on the Cuban Experience tour. The cobbled streets are the most ‘cobblesome’ I’ve ever come across – do not wear high heels, you have been warned! Valle de los Ingenios (Valley of the Sugar Mills) – Santa Spiritus – near Trinidad. This market sold almost nothing but white fabrics, embroidery and crochet, clothes, souvenirs and crafts. It is also the market where I was overcome by sellers pleading with me to give them my accessories, sunglasses, trainers off my feet, loose clothing…needless to say I left without my H&M accessories, but those women were highly delighted wearing them and posing for pictures for me with them on….small things can bring a huge amount of cheer! Three ladies selling in the market, each one bagged a H&M ring today!! The ladies selling their wares at this market are a force to be reckoned with, and that’s no understatement. Iznaga Tower, Valle de los Ingenios You can climb to the top of that tower, I did one flight of stairs and that was enough – it’s super steep and very narrow. One generous seller gave me a free pair of maraca – after buying a crochet top from her stall! I picked up the bongos in Varadero, and the seller threw in the percussion blocks/sticks as well – and wanted t give me another free gift on top but I declined and told him it was too much for him to give away – their generosity is unlike anything I’ve ever known in the UK. The lovely picture our lead singer drew for me…. Thanks!! …and hats off to you for travelling to Cuba by yourself, I’ll take a look. Hey Cherryl. What is the purpose of the white market? Is it just a flea market? Why all white? Did you find any good deal? That’s a good question, I’m not sure why everything was white – but most of the items for sale were crochet, cotton and embroided clothes and fabrics. I know white holds strong significance for some of the religious initiations in Cuba, and maybe white cotton is cheaper than dyed products when buying wholesale…..if anyone knows, I’d love to know too. I didn’t think to ask at the time – especially as I was practically mobbed by some of the sellers while I was there lol 😊 It did look lovely though, blowing in the breeze! I bought a couple of items (just to be kind really) and one of the sellers gave me a free pair of maraca. I got a cute bag made from drink can rings – I’ll add them to the blog! Fabulous colours and shots. Thanks for the trip. Hey, dumb question. When you say you went to Trinidad, do you mean Trinidad and Tobago or is there actually a city in Cuba called Trinidad?